Citation: C N Trueman "Not One Step Back – Order 227"
Not One Step Back’ was officially Order Number 227 issued by the Soviet High Command and signed by Joseph Stalin on July 28th, 1942. 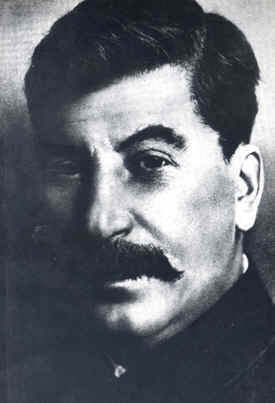 ‘Not One Step Back’ was issued in direct response to Stalin’s correct belief that the Nazi’s ‘Operation Blue’ would target Stalingrad. The order was distributed to every unit in the Russian armed forces and read out to all troops. “The people of our country, for all the love and respect that they have for the Red Army, are beginning to feel disappointment in it; they are losing faith in it, and many curse the Red Army for giving our people over to the yoke of the German oppressors while the Army runs away to the east. Some foolish people at the front comfort themselves by saying that we can always retreat further east, since we have much territory, much land and manpower, and that we will always have more than enough grain. They say this to excuse their shameful conduct at the front. But such talk is lies and falsehood, and only helps our enemies. After the loss of the Ukraine, Byelorussia, the Baltic lands, the Donbass and other regions, we have much less territory, far fewer people, much less grain and metal, fewer factories and industrial plants. To retreat any further would be to ruin ourselves and our Motherland. Every little scrap of land that we give up strengthens our enemy and weakens our defence, our Motherland. And so the time for retreating is over. Not one step back! That must now be our watchword. Can we take the blows of the enemy and push them back to the west? Yes, we can, because our factories in the rear are doing excellent work and the front is receiving ever more aircraft, tanks, artillery and mortars. ‘Not One Step Back’ then outlined some of the practical measures that would be introduced. Any soldiers of whatever rank found guilty of a disciplinary offence would be sent to penal battalion (known as a shtrafbat). These units would be used for marching across, for example, a minefield before a main infantry unit moved up. Order 227 stated that men in these units had to atone for their crimes against the Motherland with their blood. Another new unit created by ‘Not One Step Back’ was the ‘blocking battalion’ (known as the zagradbat). Men in these units would be at the rear of an attack and would shoot anyone not advancing quickly enough or were seen retreating. Blocking battalions would end up shooting thousands of Russian soldiers at the Battle of Stalingrad for failing to show the necessary resolve in combat.